Mangaluru, Feb 15, 2017: The unprecedented delay in supply of essential commodities in adequate quantity under Public Distribution System (PDS) is likely to temporarily force some fair price shop owners in Ullal near Mangaluru city to shut shops. What assumes significance further is the fact that Ullal, now known as Mangaluru constituency, is represented by U T Khader, the sitting Karnataka food and civil supplies minister. 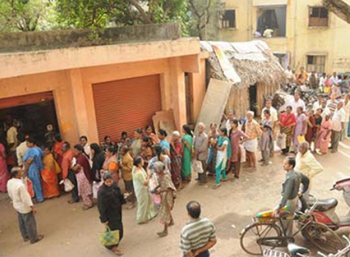 Shop owners from Kinya, Kotekar, Belma, Pavur, Manjanady and other rural areas, who complain of having to endure the delay ever since the coupon system was introduced, said that they would be forced to close shops till the problem is addressed as they are unable to cater to the increase in demand. Shop owners who have submitted a memorandum to minister for forest, ecology and environment B Ramanath Rai also the district in-charge minister, Khader and also deputy director of food and civil supplies are still waiting for a solution. According to them, they would be in a fix if the department continues to supply a meagre 30 quintals of rice against the indent of 123 quintals to be distributed among 600 odd card holders. Moreover, with the introduction of coupon system it is mandatory for shops to collect coupon numbers and submit the same to department. Any delay in uploading coupon numbers online will result in inadequate supply of essential commodities, they stated in their memorandum. Closing the shops will give solution to the problem temporarily .the minister has promise to sort out the problem but when ? When we the benefits are provided by the Government it naturally doesn’t reach them so easily have to wait for long and not as easy as you think and hear. When we hear in the news we feel its so easy , but the Q will be like monkey’s tail .